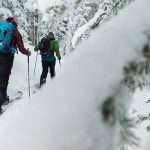 If you spend 50-percent of your time inbounds and 50-percent in the backcountry and you want to own just one pair of ski boots, this is a great choice. They’re soft, light and walkable for touring but also capable of shredding steeps at the resort. A note of full disclosure: I’ve never liked three buckle boots. They’ve always felt too soft and flimsy. But then I tried Salomon’s Quest 100 W and it totally changed my mind. A stiff, injected polyurethane shell gives you nearly all the support of a four-buckle boot, but without the bulky weight. They come in a 100 flex and an 80 flex version, so opt for the 80 if you want a softer, more intermediate-level boot. 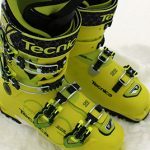 These are truly an all-mountain, inbounds and out-of-bounds ski boot for women. Flip the walk mode up and you’ll feel like you’re in a pair of lightweight AT boots on your way up the skintrack. At the top of the climb, switch back to ski mode and immediate power transfer from boot to ski is all yours. A rubber sole helped keep me slip-free and a shock-absorbing sole actually cushioned my landings. These boots are crazy comfortable, thanks to a breathable, thermo-adjustable liner (no sweaty feet!) and a roomy toe box. They were almost too spacious for my narrow feet, but my friend with slighter wider feet loved them right away. A low cuff height is meant to accommodate women’s calves, giving a more comfortable fit. For me (I’m 5’ 6”), the boot height felt a little too low, like I couldn’t get as much power through the shins. And although I’m now a three-buckle convert, the boots still don’t have the same gusto and strength as their four-buckle sisters.